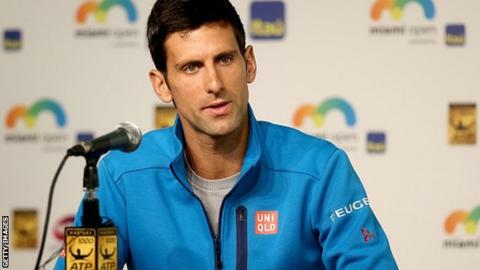 Novak Djokovic has apologised to a number of leading female players - and spoken with Andy Murray - following his comments about equal pay in tennis. The world number one suggested on Sunday that male players should earn more as they generate more income. But the Serb says he has been in touch with fellow players, including Murray, who criticised his initial stance. "I never had any intention to offend them or come up with any negative connotations," he said. The 28-year-old from Belgrade added: "I don't make any differences between the genders. I am for equality in the sport." Djokovic said he had received a message from Murray on Tuesday and that they had spoken "very openly and frankly" about the issue. The 11-time Grand Slam champion said he had also sent messages to Serena Williams, Caroline Wozniacki and Ana Ivanovic. "I feel very sorry if, in any way, I hurt my female colleague tennis players," he said. "I have a very good relationship with all of them. I have a huge respect for all of them." Djokovic had already apologised in a Facebook post on Tuesday to those people who may have been upset by his comments but went further when he faced the media in Miami on Wednesday. That followed 30 minutes of discussions with Billie Jean King, a former world number one and founder of the Women's Tennis Association. Chris Evert also spoke to Djokovic in Miami. Evert, an 18-time Grand Slam champion, pointed to Djokovic's cultural upbringing as a possible reason behind some of his views. "The Europeans were behind the Americans when it came to accepting equality," Evert said. "I doubt you'd hear that as much from the American men players and I'm sort of applauding America for that." Evert says the men's game has benefitted a lot from the rivalry of Djokovic, Roger Federer and Rafael Nadal. But the American believes that the popularity of the men's and women's games is "cyclical". "I know the women were bigger draws in certain eras, especially when we had American women at the top and European men at the top," she said. "The last couple of years have been a golden era for the men's game because you've got three of the greatest players of all time."